I like them both Terri, both very pretty and dainty. Luv the first one best coz of the vibrant colors. I love teacup Tuesdays! I really like the unusual one with the two stamps... very interesting. It's a really cute one. Have a great day! I love your teacups you are featuring today. My favorite, tho, is the first one. It is stunning! The blue trees are so unusual! Thank you so much for cohosting this wonderful weekly party! 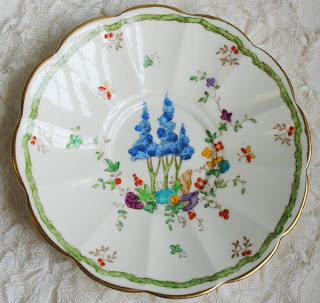 I am having so much fun bringing out my teacups, reminescing and sharing with eveyone and meeting new friends. You are wonderful!! Visiting you is a great pleasure for me ! 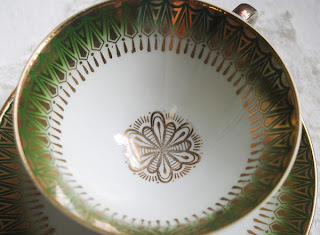 I enjoyed these beautiful teacups and your descriptions! 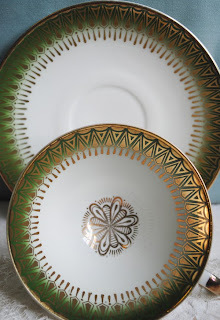 I have several "new" teacups purchased on my trip to Alaska and I can hardy wait until I get home and can blog about them. Thank you for hostessing again! Wishing you a wonderful & happy Tea Tuesday! Terri, That first cup is just awesome! So vibrant and colorful! Terri, I have fallen hard for that first cup! The design is so sweet and very different from anything I have ever seen. What a treasure! Wonderful cups. Love the first one with the wonderful flowers and dainty butterflies and the second for the color and pattern! Happy Tea Day! Terri...another beautiful post that dazzles my heart!! Sooo pretty! and yes that green one is pretty fascinating..what a wonderfully unique piece! thanks for everything again and i love my book! Blessings and hugs and appreciation for the wonderful soul you are! Have a happy tea..thanks for another inspiring post!! yay! Both of these teacups are so pretty but, so different! I love both of them for their uniqueness! That first one is a small work of art. So, different! 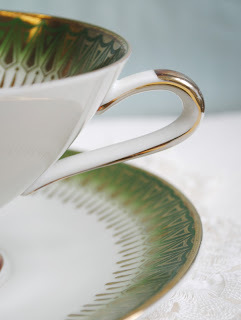 I love this idea of Tea Cup Tuesday, it is so lady-like and feminine. I have to pic-out my cup for next week! I really like the first cup, it is so unusual. 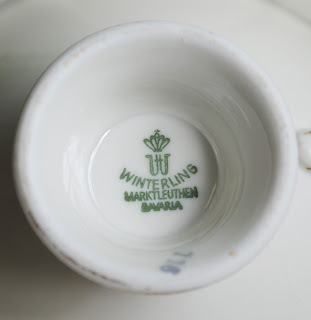 All the cups are exquisite, but the 'unusual' one is just amazing. And what a thrill to be able to give it a home. Terri, your teacups are very nice and yes, unusual! Thank you for sharing them with us. Happy Tea Tuesday! What wonderful cups you have. I get so inspired to get more cups as well. Thank you for a cozy and vintage-like blog. They are both unusual. The hand painted design of the first cup is quite unique. I also like the pretty green color and shape of the second cup. Wow, those really are unusual. And very pretty, both of them. That first one is very intriguing - I just love the colors. And I've never seen two backstamps, either. 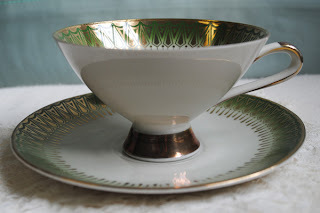 What a delightful theme for this week Terri; 'unusual teacups'! 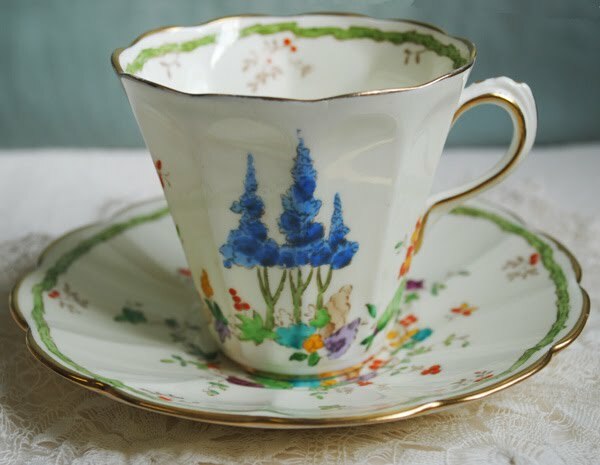 Your teacups as always, are exceptional my dear fellow, Tuesday Teatime friend!~ I especially love the first one, although they are all so very fine! This week is also my 45th,'Tuesday Tea For Two'; where does the time go?! 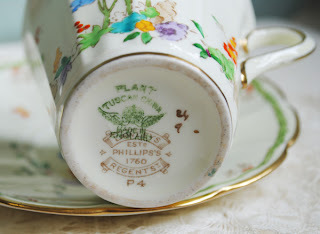 Please do come by to also kindly link up and perhaps also leave note to let me know how you like my pretty little teacup for this week's TCT.., I always so enjoy your comments and visits dear lady! I love the green in the second cup! I have never seen the double stamping either..take care. Lovely cups! I like the first one a lot. It is just wonderful! Your teacups are fabulous as usual... especially the first one. 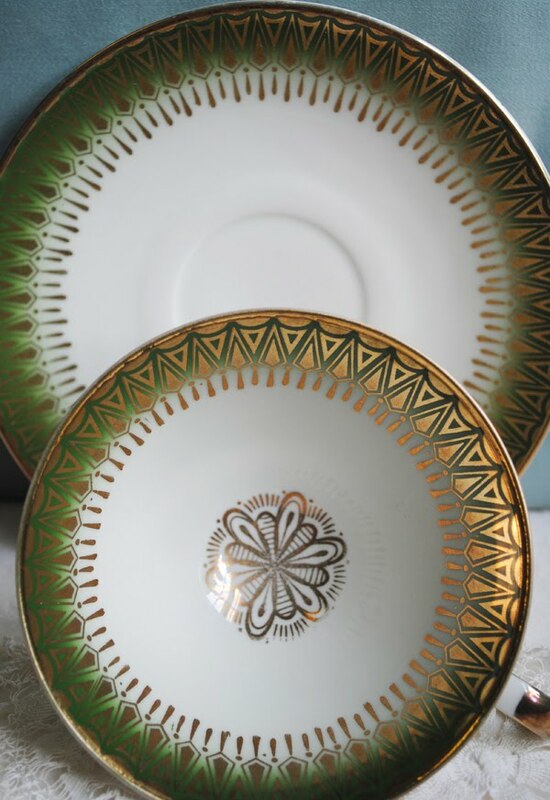 Love the pattern and the colors! Hi Terri, thank you so much for visiting my blog and for your nice compliment on my tutu. It's my first and I'm just tickled with it! I adore your teacup this week. What a lovely collection you have. Thanks so much for sharing! Hello Terri- Thank you for visiting and wishing me well. I am doing much better now. Your teacups are splendid but I absolutely love the first one. It is so ‘Happy’ looking. That’s the word that fits! It looks like little gnomes could jump out from behind those trees at any moment. It is adorable. Take care. Your first teacup looks very precious ..... certainly looks hand-painted. Quite unique I should say! My goodness, both teacups but oh so different. Delightful photos, thanks for sharing them. Oh, I absolutely love that first tea cup. Simply remarkable! 3, Cheap Lunesta - Generic Lunesta - lunesta medication http://www.lunestabenefits.net/.